Our 45th reunion is just days away! Hope we have lots of our classmates able to make our event! Be sure to check out the details of our reunion and what might be going on during your off time on Saturday afternoon in Fort Dodge if you decide not to golf. Just an additional note for the St. Edmond game on Friday. If you are going to the tailgate at Lynn Mulholland Bohlke's house. Friday - 5:00-6:45 pm tailgate at the home of Lynn (Mulholland) & Charlie Bohlke at 1844 8th Ave. N. , there will be ample parking if your park behind her house on 8 1/2 Ave. N- St. Edmond football game at 7:00 pm, then to St. Edmond for appetizers and drinks. When you come to the game just go through the gate and tell the ticket takers that you are with the SE Class of 1973. You will be admitted without having to pay for the game. Just come and enjoy. There will be a banner toward the North end of the bleachers where the class will be sitting. The school will be open for those that do not wish to attend the game. After the game we will gather at the school for a social, drinks and appetizers. Saturday - golf in the am (details will follow when secured). Mass at St. Edmond with the Class of 1978 at 4:15 pm. Heavy appetizers and dancing at Willow Ridge beginning at 5:00 pm. It is still not too late to make plans to come to our 45th Reunion! If you can make it we would still love to have you join us! Just come that night and you can make payment when you come. Looks like it is shaping up to be a pretty well attended event! With the reunion less than a month away, we have gotten several of our classmates that have committed to having a good time at the reunion! The list continues to grow! Make plans to come, it won't be the same without you! We hope to have even more coming for the weekend. Lynn Mulholland Bohlke has graciously gathered some information with a list of things to do during your off time if you are not interested in golfing. 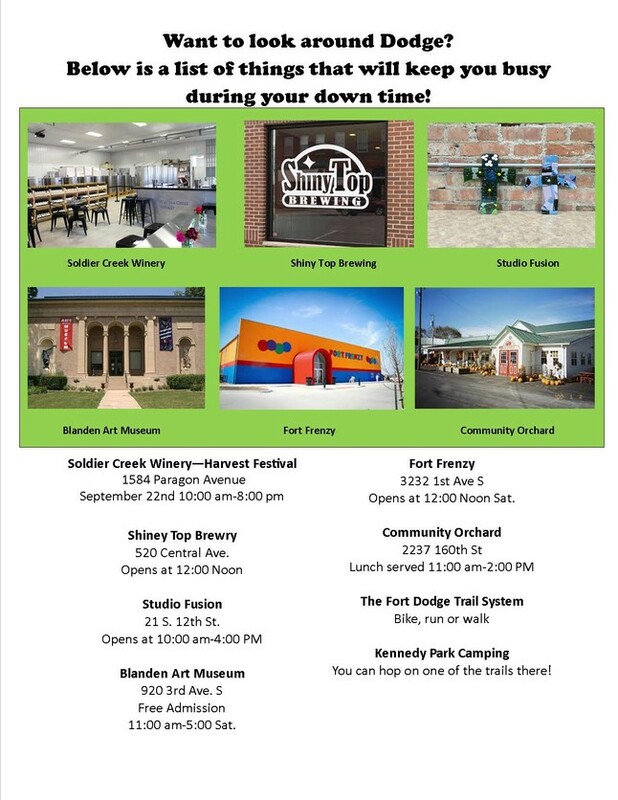 Check below for a great list of activities to explore some of the things Fort Dodge has to offer! Reservation information is again listed below our list of activities!!! Hope to see lots there. There are rooms reserved at the Holiday Inn Express for the Class of 1973. It is located near the Culvers on 5th Ave. S. You can call 515-576-3313 for reservations before August 21st. 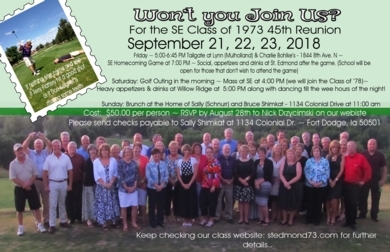 Be sure to indicate that it is for the 1973 St. Edmond Class Reunion as the Class of 1978 also has some rooms set aside. All rooms not picked up by group will release on Aug 21st. All rooms come equipped with refrigerator, microwave, Keurig coffee makers. We have a complimentary hot breakfast each morning and a pool, spa and fitness center. As always, if you have any questions, please email Nick Drzycimski at drzycimn@yahoo.com. If you haven't reserved your room yet, you are in luck! Holiday Inn Express has extended the block of rooms for the Class of 1973 until September 7th. Don't forget to get in touch with them to get your room reserved. If you plan on attending the reunion in September, please be sure to RSVP to Nick Drzycimski at drzycimn@yahoo.com . If you know that you will be attending it would be a great help with expenses if you could send your payment to Sally Shimkat at 1134 Colonial Drive, Fort Dodge, IA 50501 by the end of August. September will be here before you know it. You know, it is true, the older we get the faster time goes!!! Hope all make plans to attend this year's reunion. Please make sure you join us for our 45th Class Reunion on September 21, 22, 23, 2018. Here is what we have planned so far. Friday - 5:00-6:45 pm tailgate at the home of Lynn (Mulholland) & Charlie Bohlke at 1844 8th Ave. N. - St. Edmond football game at 7:00 pm, then to St. Edmond for appetizers and drinks. The school will be open for those that do not wish to attend the game. Saturday - golf in the am (details will follow when secured). Mass at St. Edmond with the Class of 1978 at 4:00 pm. Heavy appetizers and dancing at Willow Ridge beginning at 5:00 pm. Sunday - Brunch at the home of Sally (Schnurr) & Bruce Shimkat at 11:00 am - 1134 Colonial Drive. We will be getting together a list of different things for you to do on Saturday to help fill the time until our Mass so be looking for that. The weekend cost is $50.00 per person. All checks to be made out to Sally Shimkat and sent to her address 1134 Colonial Drive. We hope that you all can make it. The last one was so much fun and hope to have a great turn out for the 45th as well!! It's already that time! Time to start planning for our 45th. If anyone would like to join the group, please contact Nick Drzycimski and he can notify you when we will be meeting. We are thinking maybe in the fall of 2018 and maybe catching an SE Football game this time. We'd love to have you join us, the more the merrier! The date has been set and the details are being hammered out! Our 45th Class Reunion the weekend of September 21-23rd. We are planning to attend a St. Edmond Football Game on Friday if they are playing at home then go to the school for cocktails and appetizers. 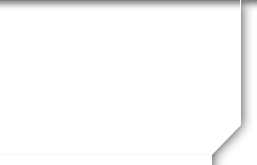 We will know more about the football game when the schedule comes out. Saturday we will again have our event at Willow Ridge - the same place as our 40th. We will be finalizing the times in the next couple of weeks and will let you know then. We are in the process of getting a mailing together, so if you have recently changed you address please let us know at bigginsm@st-edmond.com. Clear that weekend and plan to come and have a great time on Sept. 21-23rd!! One of the members of our class passed away this last week. Paula Oldson passed away on July 27th. Please keep her and her family in your prayers.